It contains a combination of super-antioxidants, including trans- resveratrol, muscadine grape skin and seed extract, blueberry extract, and the most absorbable form of turmeric, which was formulated using groundbreaking technology. Supported by strong scientific evidence, the unique combination of active compounds in StemFlo® protects your heart and circulatory function by acting on multiple cellular processes and activating longevity pathways. The nutrients combo in StemFlo® also further supports your inner defense system responses and endothelium function, and enhances healthy stem cell flow. StemFlo® has been formulated with non-GMO, gluten-free organic and non-irradiated ingredients, and does not contain fillers, sugar, artificial colors, non-natural flavors, dairy, yeast or preservatives. 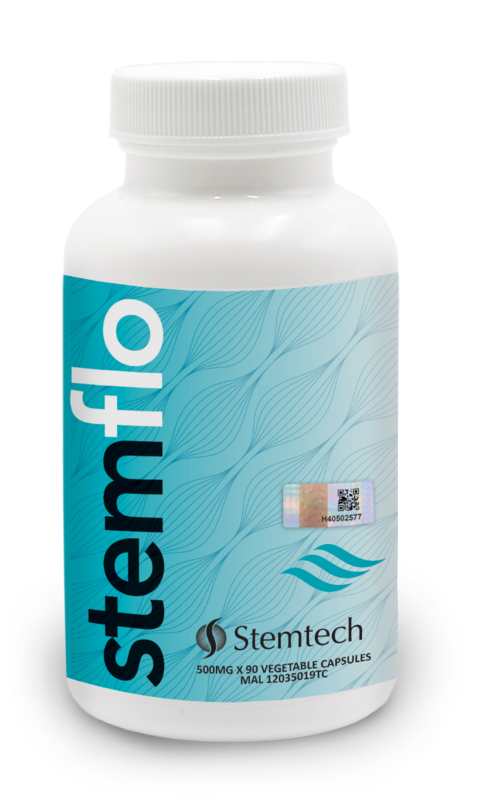 StemFlo® is backed by novel science & technology and nutritionally optimizes circulation of healthy stem cells, protects your cells in the cardiovascular system from oxidative damage, and supports your energy and longevity processes.